His latest project, co-curated with arts writer Sally O’Reilly, is Magic Show. This is a Hayward Touring exhibition organised in collaboration with QUAD, Derby’s new centre for art and film. It runs at QUAD from 28 November to 31 January 2010. I urge anyone who has a serious interest in magic not to miss it. After the Derby show the exhibition embarks on a national tour to Blackpool, Carlisle, Cardiff and London. For some, the idea of magic suggests fantasy and illusion, while for others it signals a licence to practise deception. 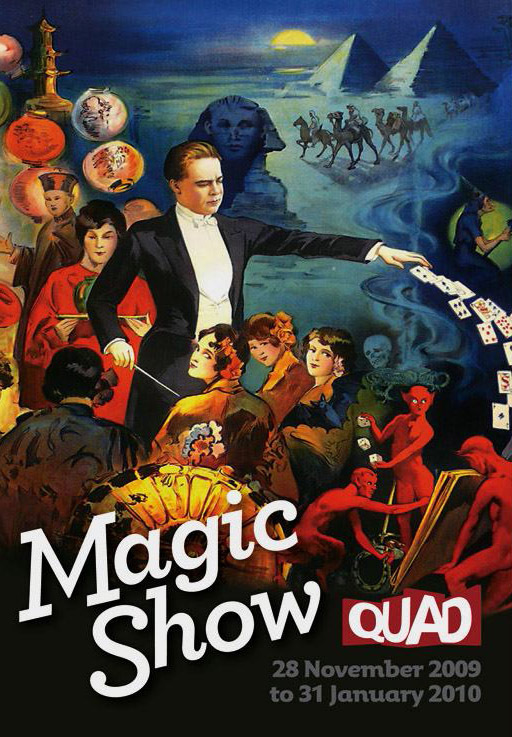 Magic Show considers how art and magic often share common ground, and how contemporary artists may adopt the perception-shifting tactics of the theatrical magician to lead the viewer while exploring the power of suggestion itself. It includes work by 24 international artists, with new commissions and performances, and an archive of historical magic posters, curious props and offbeat ephemera (a bit like The Magick Lounge then!). The exhibition demonstrates how art and magic both flourish in the gap between fact and fiction, where eyes may be misdirected, and considers the potential of trickery and illusion to creatively undermine logical thought. Artists include Zoe Beloff, Joan Brossa, Jackie and Denise Chapwoman, Tom Friedman, Christian Jankowski, Janice Kerbel, Juan Muñoz, Ian Saville and Suzanne Treister. Among the artworks in the exhibition are the California-based Center for Tactical Magic’s Ultimate Jacket which has 50 pockets for optimum concealment and retrieval, which is probably even more than recent Lounge lecturer James Prince; Susan Hiller’s Homage to Yves Klein, which incorporates found photographs of people levitating – ranging from the low-tech sham to highly sophisticated ruse, and Failing to Levitate in the Studio, which documents Bruce Nauman’s similar attempts to get off the ground. Commissioned for selected venues during the tour of Magic Show, Sinta Werner’s site-specific installations mimic architectural features within the gallery to distort space and disorientate visitors. Highlights of the archive section include Paul Kieve’s collection of historical posters from theatrical magic’s ‘Golden Era’ (c.1890-1930), which play up to the idea of the magician as a princely commander of unearthly forces or an ethereal woman with otherworldly powers; Tommy Cooper‘s Dippy Duck; and the personal scrapbook of British conjurer and socialite Stanley Collins, containing satirical cartoons of politicians as magicians that shape political realities. Open: 11:00am to 6:00pm daily (except Sunday opening at 12 noon). Tel: 01332 290606 Admission: free. Sounds fantastic. Whilst I could go on about magic as art and wanting to see the installations and other pretentious arty stuff, lets be honest, and not kid ourselves, all we really want to see is Dippy Duck!!!!! Question: Will Dippy Duck be presented cut in half in a glass tank of formaldehide? Formaldehyde? Now you’re being silly… Cuprinol surely. Went to see the exhibition on Sunday with an artist mate of mine and had a great time. Favorites have to be the 16mm films of the Log enchanter and the rolling stones, Dippy Duck (obviously) and the “Magicians Table with bones”. If you can’t catch it at Derby, catch it at Blackpool.